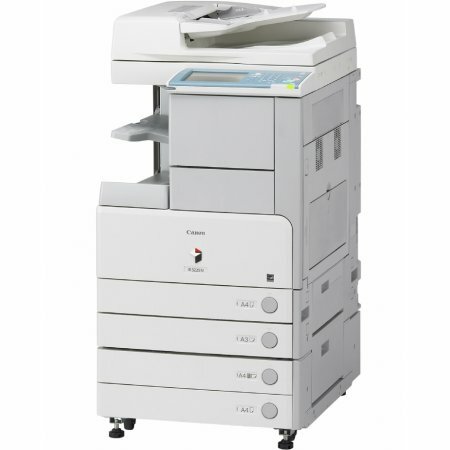 The Canon IR-3245N multifunction copier addresses the lack of network feature of the previous IR version. The network-ready IR3245N laser printer offers all the same functions and features, including high-speed and high quality printing, scanning, copying, and faxing, with the addition of easy network sharing. It has an excellent monthly duty capacity and versatile media handling options, allowing users to maximise the machine's applications. The Canon IR-3245N printer produces up to 45 imprints per minute, though it can only deliver black and white outputs, unlike other multifunction lasers that offer colour printing on top of their multifunction features. The Canon IR-3245N black and white laser printer measures some 35x22x27 inches and weighs about 181 pounds. It may be a bulk for small offices, but larger workplaces with space to spare will not have any trouble setting up the unit. The Canon ImageRUNNER 3245N office printer comes with a 512 MB internal memory and a 60 GB hard drive, which help in handling large print tasks smoothly. The Canon IR-3245N digital photocopier even offers network connectivity, in addition to its versatile fax, scan, and copy features. One of the best highlights of the Canon IR3245N mono laser printer is its capability to connect to a network of computers, allowing multiple users to have access to the printer and its many features. The ImageRUNNER IR3245N black and white copier prints at a speedy rate of 45 ppm and produces high-quality prints up to 1200x600 dpi. Duplicates come out at about the same rate, increasing overall productivity. Media handling is also notable, as the unit is able to keep a maximum of 4,950 sheets in its paper cassettes and multipurpose trays. Output costs are minimal thanks to the cost-effective Canon IR3245N toner which lasts for up to 24,000 prints. However, the Canon IR-3245N multifunction printer still does not offer colour printing and it might be an impractical solution for small offices that do not require high-volume printing on a regular basis.